Well, when we're not printing or binding books we have other businesses we run. Rita is an energy medicine practitioner and is also deeply involved in Permaculture design, trying to create a self-sustaining environment here on our property. I have an audio production studio and engineer and record music, which is what my formal training and career has been. I've begun to combine my interest in books and recording sound by creating an audiobook of Lord Dunsany stories, The Vengeance of Thor, that are a blend of music, narration and radio drama woven into the tales, really fun and satisfying to do. 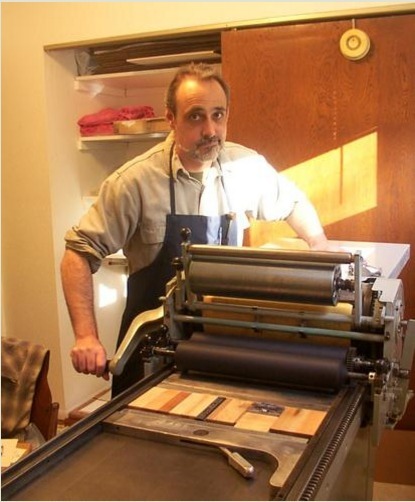 How did you get started in the fine press field? That grew out of collecting nice books and gradually growing more curious about how they were made. Knowing about and reading William Morris had a lot to do with it because of his printing at Kelmscott. That led me to a Roycroft edition of a Morris book and I explored the printing career of Elbert Hubbard. 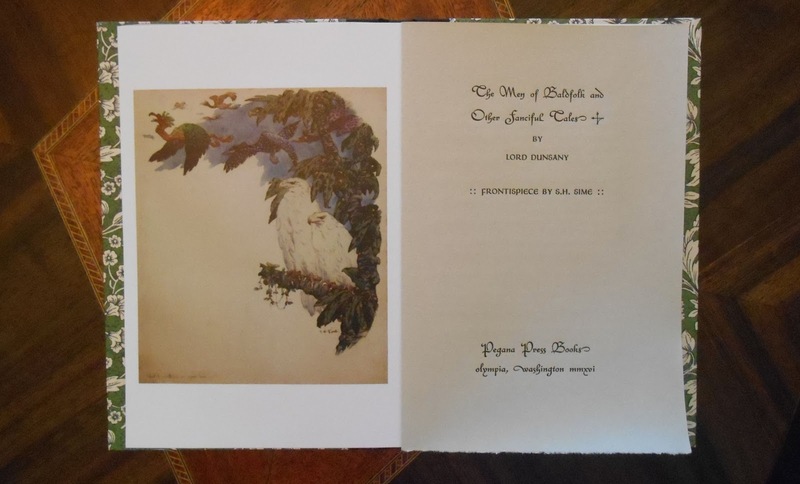 I was also collecting Clark Ashton Smith at the time and tracked down some of the letterpress chapbooks that Roy Squires had printed in California and that was a big eye opener as well. Strangely, I had talked with Squires years before this and bought Kai Lung and Lord Dunsany first editions from him as a bookseller without knowing that he was a well respected printer in the Fantasy/Supernatural field. Around this time, a local college was offering letterpress printing and bookbinding classes and Rita encouraged me to take one. I found the process extremely interesting and satisfying and began to get curious about the different printing presses and their function. At some point I just decided to go for it and buy a press and begin printing. I started with a broadside of Lord Dunsany's first published poem Rhymes From A Suburb. I then ran into some information about other works by Hope Mirrlees, the author of Lud-in-the-Mist, and discovered she had written a long surrealist prose poem Paris in 1919 that was now almost totally forgotten. It had been printed by Virginia Woolf and exhibited extremely interesting typesetting to support the text. I spent a year printing it, measuring and duplicating the spacing from scans of the original. Tell us about your interests in fantasy literature, and how that developed. Well I suppose growing up in the late 60's and early 70's my exposure to comics (and having them mailed to me) and fantasy based cartoons may have been the start. I somehow (like many of us) found paperbacks, primarily the Ballantine Adult Fantasy series put together by Lin Carter. This introduced me to many of the authors which in turn led to many other authors and collecting began in earnest. I was also exposed to the wildly fantastic progressive rock music happening in the early to mid 70's, Yes and Genesis and the amazing artwork and lyrics going on. At some point I began looking at hardbacks rather than paperbacks in bookstores and began seeking finer editions; being in Spokane at the time there was never much to see in rare fantasy books though so I began to purchase through catalogs. I moved to Seattle to work in a recording studio and walked into a used bookstore that had an almost complete collection of Lord Dunsany first editions, books I had only dreamed of, that was a day to remember! Dunsany is my favorite author, an amazing man and a visionary who wrote much of his work with little, if any editing. He wrote almost nonstop, and there are stories of his scattered everywhere that haven't seen the light of day. He cared about the design of his books and also had custom bindings done for himself so I think it's appropriate that his work has a beautiful vehicle to carry it. I began with the grandiose idea (since shelved) of doing a deluxe velum version of The Charwoman's Shadow which would have taken almost 3 years of typesetting by hand to complete but I had contacted the Dunsany Estate for permission and established a dialogue with Lady Dunsany. At some point I ran into a list of uncollected Dunsany stories and began to track down the magazines they had been published in and that started the Lost Tales series of books. Lady Dunsany is very supportive of craftsmanship and art and has been extraordinarily kind enough, with the Curator's invaluable assistance, to provide us with unpublished stories and rare artwork from the Castle. 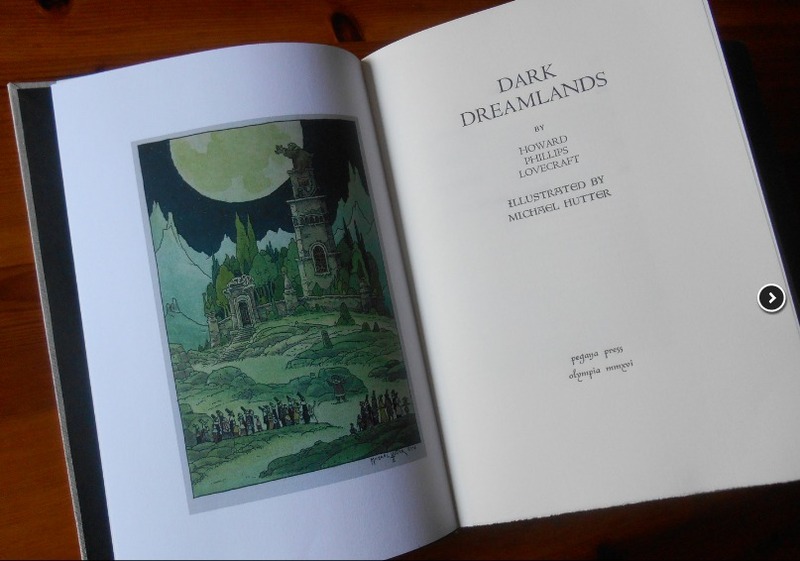 Part of what I try to do with Pegana Press is add to the canon of fantasy with something lost, rare or unusual as opposed to just redoing what has been done before. I think it's important to share these Dunsany gems to those who will appreciate them. Describe the development of a book idea over time, from conception to publication. I usually come at each book from a different direction. I begin by choosing an author or work I'd like to have in my library and that no one has else has done. Then I have to decide on the design and physical structure of the book to determine what kinds of paper and type will be used. One of the Clark Ashton Smith books we did utilized Golden Rectangle proportions for everything and we used an ancient looking Lokta paper from Nepal as endpapers, I really wanted the book to feel prediluvian in nature and magical as the stories are about Necromancers in Poseidonis. The Lovecraft Edition was based on the proportions of a James Branch Cabell book I own that I really like the look and feel of. I also do chapbooks that require less structural decisions. After the design concept is clear in my mind, I start thinking about art and how to get something cool for the book. The great thing about the internet is it allows me to have worked with artists in Germany, Fiji and France to realize some of these books. From here the real work begins of typesetting each letter by hand and then laboriously printing a page at a time. This is where our books are totally unique in the genres of Fantasy and Supernatural, no one else that I know of is doing fine edition letterpress like this. All the paper and materials are cut by hand. Once printing is done all the sheets are folded by hand and Rita begins the sewing and binding. All the binding and sewing is done by hand. Some of the binding is also done by Ars Obscura in Seattle. From there it's a matter of marketing the book and finding collectors interested in what we do, a full time occupation by itself. Any authors you want to do but haven’t got round to yet? There are so many, Robert W. Chambers, E.R. 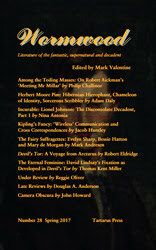 Eddison, Ernest Bramah, Donald Corley, William Morris, Ursula K. Le Guin, Robert E. Howard, Eden Phillpotts. I still have more unpublished Lord Dunsany to get through as well. I'm just finishing a Fritz Leiber chapbook so he's off the short term board. I also like to hear from people what they think I should print, I thrive on feedback and enjoy finding out what they want in their own libraries. The poet Kenneth Hopkins (1914-1988) was for many years a friend of E.H. Visiak (1878-1972). Hopkins published three detective novels featuring the elderly Dr. William Blow and his friend Professor Gideon Manciple. 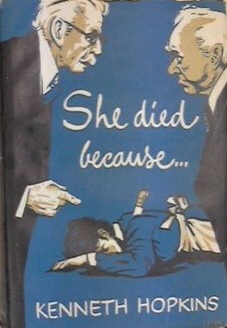 In published order they are She Died Because . . . (1957), Dead Against My Principles (1960) and Body Blow (1962). In US editions, they were published out of order (Dead first, She second and Body third), between 1962 and 1965, and the blurbs get the ages of Blow and Manciple wrong. When She Died Because ... was first published in England, Blow's age is about 79. Curiously, that's the same age as E.H. Visiak was at that time. Coincidence? No, for Hopkins dedicated the book "To E.H. Visiak, as dedicated a scholar as Dr. Blow, but luckier with his domestics." And in inscribing a copy of Body Blow to John Arlott, Hopkins wrote: "No prizes for recognising the original of Dr. Blow." This lampooning of Visiak as Dr. Blow is affectionate, witty and addictive. I zipped through all three Dr. Blow novels when I first discovered them in Perennial Library paperbacks in the mid-1980s. And I periodically re-read them, both for sheer pleasure and for the insight they give to the often inscrutable character of their model. 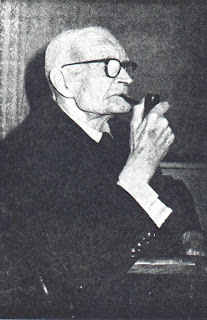 Hopkins wrote Visiak's obituary for the Royal Society of Literature, noting that Visiak "lived a secluded life, and in later years his health was indifferent, and he reserved his energies for his own work, and for entertaining a few friends who delighted in his learning and insight. How many evenings have I passed in that seaside flat high above Adelaide Crescent in Hove, with the dark room heavy with cigar smoke, and Visiak's deep voice elucidating some tricky point in the interpretation of the Doctrine and Discipline of Divorce, or a disputed reading in Of Prelatical Episcopacy: it all sounds pretty dull stuff, but Visiak had the gift of making it exciting, and that's a gift somewhat rare among scholars." 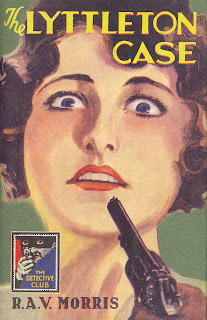 Besides the three Dr. Blow novels, Hopkins published five other mystery novels, four of which concern a newspaperman named Gerry Lee, including The Girl Who Died (1955), The Forty-First Passenger (1958), Pierce with a Pin (1960), and Campus Corpse (1963). Hopkins's final mystery was Amateur Agent (1964), published under the pseudonym "Christopher Adams". 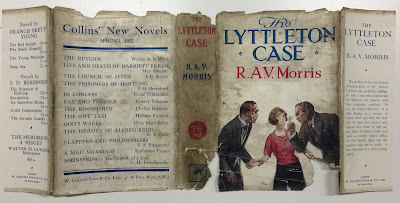 First published in 1922, The Lyttleton Case by R.A.V. Morris went through some seven printings through 1930, before lapsing into obscurity, possibly because the author wrote no follow-ups of the detective adventures of Chief Inspector James Candlish. In 1971, in their Catalogue of Crime, Jacques Barzun and Wendell Hertig Taylor called it "an early specimen of the well-written, slow, carefully plotted puzzle," and concluded "this is an acceptable tale of murder, impersonation, and abduction, withe entertaining asides about the contemporary scene." 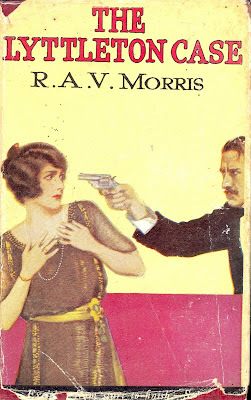 Ronald Arthur Vennor Morris (1877-1943) was the older brother of the classic fantasist Kenneth Morris (1879-1937). R.A.V. Morris published only this one book. 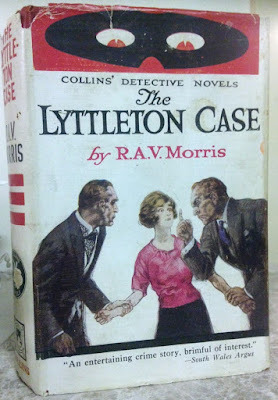 The Lyttleton Case is now republished (on May 18th) by HarperCollins in their Detective Story Club series about which I have written previously. I wrote a short introduction for this reissue, which is a nicely done hardcover at the low price of £ 9.99 from Amazon in the UK. The cover of the new edition is above. Below I'll post some of the early dust-wrappers from early editions. 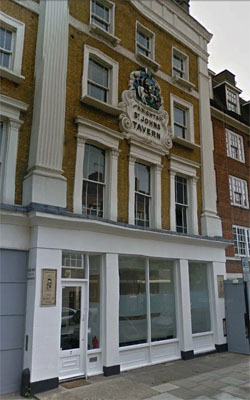 ‘I wondered a long time about the whereabouts of this tavern. … The long and the short of it is that on a warm Sunday evening in early September I found myself in Clifton Hill, St. John’s Wood. I had had some correspondence with Mr Machen a year or two before his death; and he had assured me that this particular tavern (he gave no guarantee as to others) was not fabulous; he had even given me exact details as to its whereabouts. And it all fitted in, at least on the material level, with the description in his book. But ... Here, in what Mr Machen’s spirit had made an oasis for his body, I found only confusion and decay, peeling stucco and peeling standards of inward living, the dreariness and drabness of a suburb that has ceased to hold the impulse that built it. 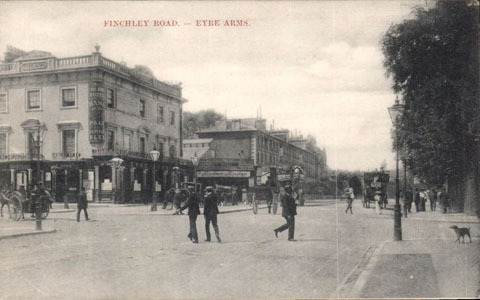 St John’s Wood, it seemed to me as I hesitated outside the unobtrusive tavern, was all rats and flats: rats in the bombed houses and flats in the rest. I did not enter the tavern; I should have felt like Pascal at a bacchanal. And so, annoyingly, Hogan does not reveal the location of the tavern. Sadly, the buildings housing both The Eyre Arms and The Princess Royal have both been rebuilt, and The Knights of St John is now closed, so we cannot visit any of these establishments today in the hope of finding Machen’s ‘pleasant and retired spot’. But, as Hogan suggests, perhaps it would be wisest to simply re-read The London Adventure, and not chase chimeras. Robert Aickman’s vast unpublished philosophical work Panacea must certainly cast some light on his early thinking and attitude to life, and may possibly illuminate some of his strange stories. Doug Anderson is the first to attempt an analysis of it, starting with an estimate of when it was written, how much was written (rather more than Aickman thought) and broadly what it seems to achieve. In Part 1 of his study, he also provides a succinct summary of the first 27 chapters. Philip Challinor meanwhile continues his close reading of Aickman’s stories with an essay discussing “Meeting Mr Millar”. The story contains some evident autobiographical details, Philip notes: and, unusually, Aickman provides not one explanation but two. This, however, should make us even more wary than where there are none. Reggie Oliver’s reviews include a discussion of a recent biography of Elizabeth Jane Howard, and he notes that her impulsive character and intense emotional life were the essential qualities that made her writing so authentic: there was a symbiosis between the life and the literature. Lionel Johnson might be seen as the last lost decadent – he has never had even the twilight esteem of Ernest Dowson, say, or John Gray. Nina Antonia sets out to put that right with the first part of an extensive study of his life and work. There emerges a figure, “Mystic & Cavalier”, whose dedication to poetry and to austere ideals, not always realised (which of us does?) deserves our respect. ‘Hibernian Hierophant, Chameleon of Identity, Sorcerous Scribbler’ says Adam Daly of his subject, Herbert Moore Pim, an author whose life seems to have been dedicated to provocation. But was there a secret purpose behind his changeable character? Adam suggests a surprising but plausible answer. We might be equally surprised to find late-Victorian fairy stories linked to the women’s rights movement. But Mark Andresen, in his essay on ‘The Fairy Suffragettes’, explores how three women working in children’s fiction used their stories to provide new models for the independent and creative individual. Rudyard Kipling, once lauded as the “poet of Empire” is now more often seen as the “relic of the Raj”, says Jacob Huntley. But he was a more complex figure than either the accolade or the dismissal. This essay discusses his abiding interest in the modern and in the realms of the spirit, neither of them obvious fits with his imperialist reputation. 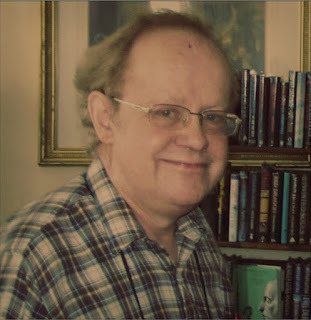 David Lindsay was also the author of several vast works, one (The Witch) not yet fully published, the other, Devil’s Tor, published but often hard to find. Robert Eldridge and Thomas Kent Miller offer separate perspectives on the second of these, finding in it on the one hand a profound expression of the otherworldly and on the other a strong allegiance to the eternal feminine. We are very sorry to learn that the veteran ghost story editor, scholar and bookseller Richard Dalby has died aged 68 at his home in Scarborough. Richard was one of the most learned authorities on supernatural fiction of his time. He edited a succession of well-chosen and pioneering anthologies, including the Virago volumes of women’s ghost stories, the Mammoth Books of ghost stories, the Jamesian collection Ghosts & Scholars (with Rosemary Pardoe) and several popular books of Christmas ghost stories and thrillers. Other noted volumes include The Sorceress in Stained-Glass (1971), Dracula’s Brood (1989) and Tales of Witchcraft (1991), all highly respected and now much sought-after. He also introduced many editions of rare ghost story collections by little-known authors, taking a leading role in The Ghost Story Press (with David Tibet) and later working with Sarob Press, Tartarus Press and others. His most recent book was characteristic: an edition of previously uncollected antiquarian ghost stories, The Haunted Haven by A Erskine Ellis (Phantasm Press). Richard’s work was not, however, simply retrospective: he also championed contemporary writers, often bringing them to a wider audience through his books. I can vouch for this personally: Richard was the first to publish one of my own stories professionally. 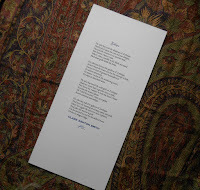 In a manner typical of his wide reading, he had noticed the story in a small press booklet and I still remember the joy his unexpected and courteous request to reprint it brought me. Nor was Richard’s work limited to the ghost story, though this was his abiding interest. He also acted as an unofficial deputy editor to the journal Book & Magazine Collector, checking the bibliographies and price guides, and contributing many articles throughout its history from 1984-2010. Again, Richard kindly introduced me to the journal, suggesting I write about Michael Arlen in his centenary year, and often putting forward ideas for other subjects. I know I was far from alone in receiving Richard's encouragement and advice. Richard’s career began in bookshops in London, including Foyles, but he later became a bookseller in his own right, issuing catalogues from his home in Scarborough, North Yorkshire. His Christmas ghost story catalogues were a delight for many readers. He had lived with diabetes since early childhood but undaunted pursued his determination to make a career in literature. He was unflagging in his scholarly zeal and did not let his condition hold him back. There can have been few people with such a wide and deep knowledge of ghost stories and allied fiction as Richard. He was dedicated in his research into even the obscurest authors and books, often uncovering information that had eluded others. But he was also generous with his work, always willing to share what he had found, to help others, and to discuss ideas. His many friends will remember a shrewd, warm, enthusiastic gentleman, formidable in his learning but companionable and kindly in person.